We are all living in a Go-Mobile world where most our daily use techy stuff is attaining the capacity of portability. Reports even say that mobile devices may dominate our usual desktops or laptops or any immobile devices in few years. Therefore, if we want to move forward with time, we must shift our daily techy life to mobile devices, which is a quite simple job nowadays. As a smartphone user, you might be well known about the huge number of apps available for you, which can in-turn transform your smartphone to a multi-purpose device. These kind of useful applications are also available in the development area, which is still not much mobilized. 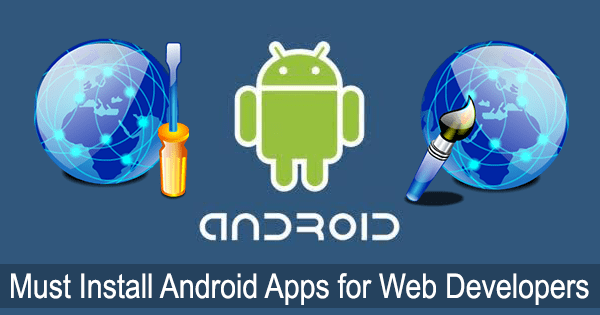 Android OS has numerous productivity applications for enhancing the web developer in you. Let us have a look on these Android apps and we’re sure that you will love them. As a developer, you will be very much familiar with source code. Suppose if you are browsing web through your smartphone or tablet and got your eyes on a website. Quite naturally, you may like to know the source code of that website. If you are not patient to open up your PC, you can make use of View Web Source, an Android application that will show you the complete source code of a single website. You have provide the URL and this app will bring you the source code in seconds. You cannot expect either syntax highlighting or formatted HTML in the app, but still it is simply great for use. As you can guess from the name, this is a FREE version of a PAID Application but it shows no discrimination in performance. 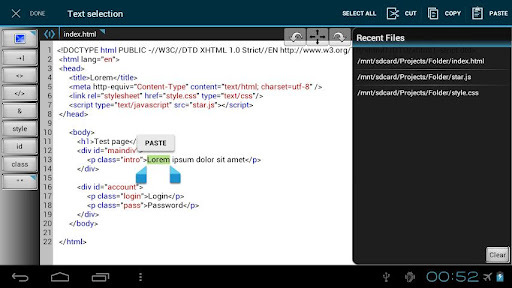 This application is a full-fledged HTML Editor for Android where you can expect decent features. You will get Syntax Highlighting, Code completion, virtual keyboard support, undo and redo options, and lots more through this HTML Editor. 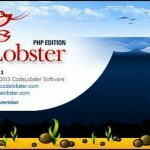 These features are available for languages including HTML, CSS, PHP and JS. Screenshots say that the app will be at its full form if you have a tablet PC rather than a small screen smartphone. Support for common hot-keys like Ctrl+C and Ctrl+V are making the application familiar with your HTML editor in PC. As the application supports vital languages including HTML and CSS, it is necessary have app for coding people because never let your coding pause due to lack of PC. You will get a built-in preview feature if you are purchasing the paid version of Webmaster’s HTML Editor. It is a true geeky one for sure. This application is entirely different from the apps listed above, as the application will be connecting you remotely to a server through Secure Shell. If you have an emergency task with server but do not have a PC, then you can make use of ConnectBot. Using this Android app, you can connect to web server, transfer files, run commands, and do everything possible with SSH Console. Simultaneous SSH Session handling, secure tunnel creation etc are also coming with this application which will grant a complete backend control of your server. If you are a professional web designer, you know the vital importance of colors in a website. Actually, that is the stuff what gives life to your page. In addition, we have seen some designers who are crazy about colors, we would prefer this app to them. Suppose if you are coding or designing a website but lacks your usual collection of colors. In this situation, Magic Color Picker will be useful for you. 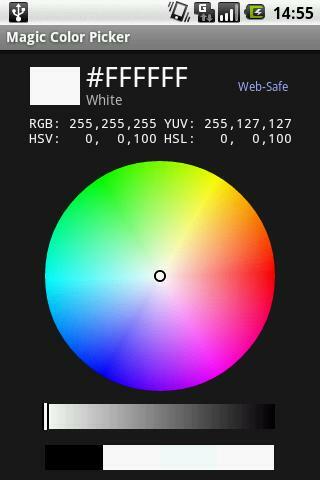 RGB, HSV, HSL and YUV models are supported by the application and you can select your favorite colors from the circle of colors by tapping on it. File Transfer Protocol (FTP) is a much easy way to transfer files to your server rather than uploading each file to the server one by one. Google Play store has an awesome application, which will allow us to manage our FTP server via Android device, which is pretty awesome. The application compatible with FTP, FTPS, SCP, SFTP, is completely free but offers a high quality performance to developers. You can download, upload, rename, create folders, sync etc. through this application and a share option from your gallery is also a noticeable feature. SSH Keys support is also stuffed with the application and it will cost you no money at all. Here comes our star of the list. What do you think about hosting and sharing files through your Android device? Won’t that be awesome? kWS web server is here to bring that awesomeness to you. Here’s an example – you have a HTML page in your device and want to show it to many people at one time. You can then use kWS Android Web Server to host that files in your device itself and access those files through others’ devices simultaneously. You can just start the server and host files in it. Point any of your devices’ browsers to the IP address given by the app, and you are done. Extends of this application is so high such that you can even host a mobile website in your Android device. It is sure that your kWS server will work very much fine if you have a steady Wi-Fi connection with you. 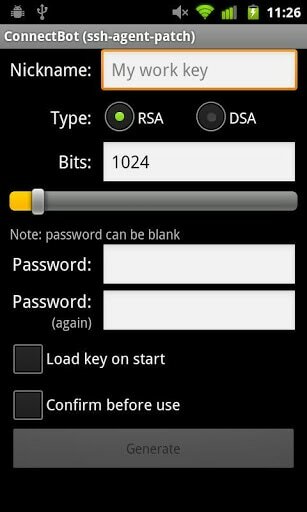 If you are that much geeky to convert your phone to a web server, you must check this app out. 920 Text Editor is another top text editor available for Android with HTML, CSS, PHP and JS support. When compared to webmaster’s HTML Editor, the language support of this one is very wide. 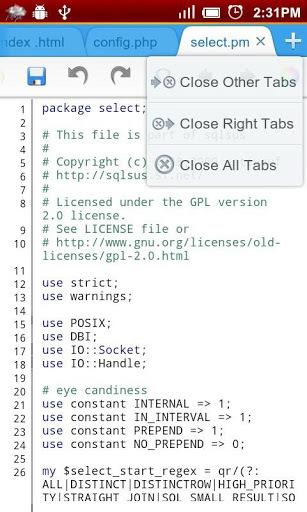 The application even supports Syntax Highlighting for ASP, C, C++, VB, SQL etc. Multi-tab management is also a noticeable feature as you can put different files on different tabs and manage them simultaneously. 920 Text Editor comes pre-loaded with session handling and configurable color-coding. Built-in preview feature is also making it best. We have listed most of the awesome apps for web developers/designers. Do let us know through comments if you have another good reference for our readers. Thanks for sharing this, installed most of this. This all apps are awesome for web developer and blogger, I am using top three, And i will try rest of them also. Thanks for sharing. As an Android developer, I can confirm that this list is a must have for all developers. If you don’t you are missing a lot. Woww! Interesting list! Installing the top 3. I have used some of this apps and I can say that Webmaster’s HTML Editor Lite is very nice little tool. I am recommending it. Btw I like the comment area of your blog with this speech recognition toll implemented this way. 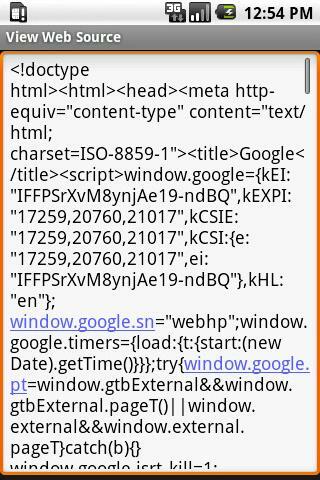 I never knew that I can code HTML on my HTC One V. Thanks for sharing man. I’ll also look at web server app. That’s really a very nice collection of apps for web developer, I will try out these apps in my android device. I have to agree that the list is pretty usefull for all the web-developers! However, I would like to know if it is safe to do these task from your smart-phone? I say this one because smart-phones are not so famous because of their antivirus systems. I look forward to your reply! Thank you! Great list. At least i dont have to find and try an error for which best and fit for my job. Thanks mate, this post is really helpful. Hello Abhijith N Arjunan, i must say nice work done. I really appreciate the way you presented all the web developer’s android phone apps. The list of applications that you have given is excellent as it contains complete applications that are helpful for web developers in their web development task. With these apps developers can make their work hassle-free. Thank to provide such wonderful list!!! Thanks Lucie for sharing these apps with our readers. This a really great list..
As a developer you sometimes you need to uninstall the application you are just developing again and again…to test the installation (initialization) process..Now you can set the widget and uninstall it again and again every time with just one click . This a really great list. As a developer you sometimes you need to uninstall the application you are just developing again and again to test the installation (initialization) process. Now you can set the widget and uninstall it, again and again, every time with just one click .